There’s nothing quite as heartfelt as a homemade or unique gift, and there are hundreds of gifts that you can make from items that you can find at the Lake Jackson ReStore! The dedicated folks who run the ReStore sell contributed items that are sold to further the mission of Habitat for Humanity — a nonprofit, Christian housing ministry that partners with local families to help them build safe and affordable houses. With the holiday season now in full swing, Beth said she hopes that Southern Brazoria residents will help stock the shelves and keep the store going. Christmas stuff is already on the shelves and selling very well. The ReStore is a great place for shoppers in the area to pick up gifts for their loved ones at reasonable prices and still give back to those in need. 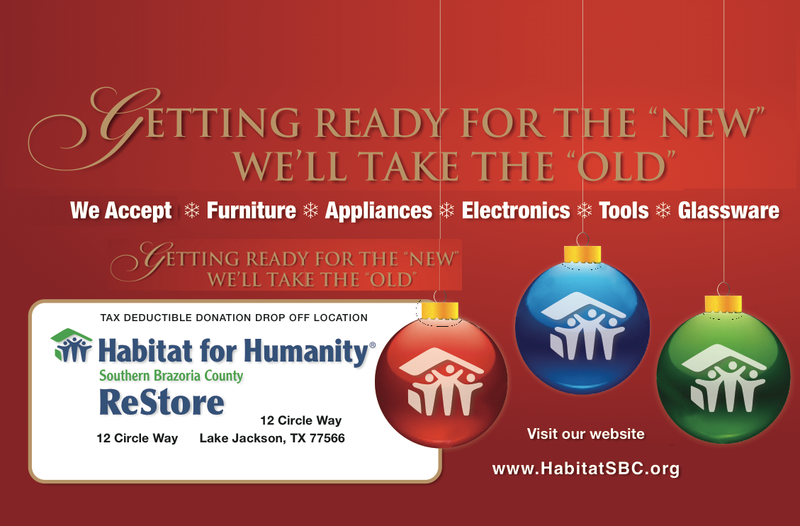 The Habitat ReStore is located in downtown Lake Jackson at 12 Circle Way. For Thanksgiving the store will be closed the week of November 21st – 26th. The ReStore will reopen Thursday December 1st. and be open till December 18th. The ReStore will reopen in 2017 on Thursday January. 12th.